Management insights in Configuration Manager provide information about the current state of your environment. The information is based on analysis of data from the site database. Insights help you to better understand your environment and take action based on the insight. This feature was released in Configuration Manager version 1802. To view the rules, your account needs the read permission on the site object. 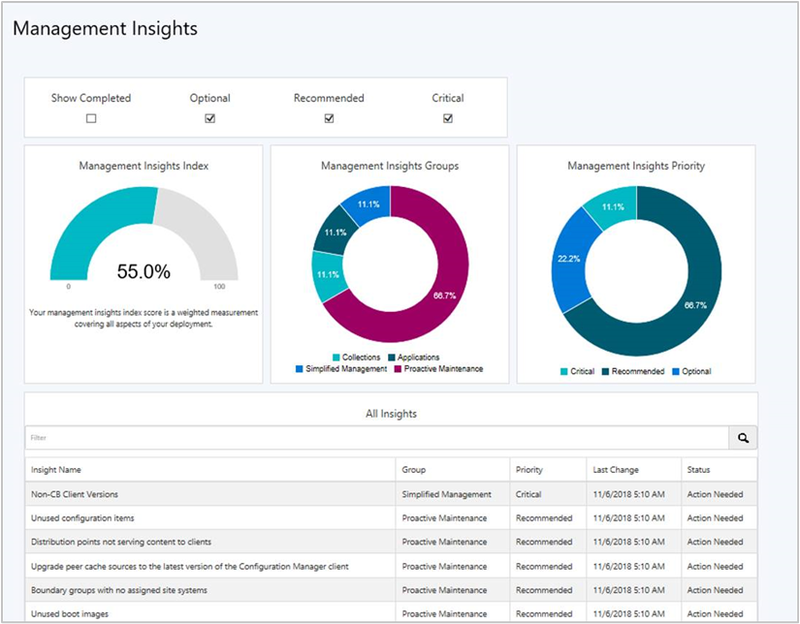 Go to the Administration workspace, expand Management Insights, and select All Insights. Starting in version 1810, when you select the Management Insights node, it shows the Management insights dashboard. Open the management insights group name you want to review. Select Show Insights in the ribbon. All Rules: Gives the complete list of rules for the management insight group chosen. Complete: Lists rules where no action is needed. In Progress: Shows rules where some, but not all, prerequisites are complete. Action Needed: Rules needing actions taken are listed. Select More Details to retrieve specific items where action is needed. The Prerequisites pane lists the required items needed to run the rule. Select a rule and then select More Details to see the rule details. Starting in version 1806, some rules let you take action. Select a rule, select More Details, and then if available select Take action. Automatically navigate in the console to the node where you can take further action. For example, if the management insight recommends changing a client setting, taking action navigates to the Client Settings node. Then take further action by modifying the default or a custom client settings object. Management insights index: Tracks overall progress on management insights rules. The index is a weighted average. Critical rules are worth the most. This index gives the least weight to optional rules. Management insights groups: Shows percent of rules in each group, honoring the filters. Select a group to drill down to the specific rules in this group. Management insights priority: Shows percent of rules by priority, honoring the filters. Insights for your application management. Applications without deployments: Lists the applications in your environment that don't have active deployments. This rule helps you find and delete unused applications to simplify the list of applications displayed in the console. For more information, see Deploy applications. Helps you integrate with many cloud services, which enable modern management of your devices. Assess co-management readiness: Helps you understand what steps are needed to enable co-management. This rule has prerequisites. For more information, see Co-management overview. Configure Azure services for use with Configuration Manager: This rule helps you onboard Configuration Manager to Azure AD, which enables clients to authenticate with the site using Azure AD. For more information, see Configure Azure services. 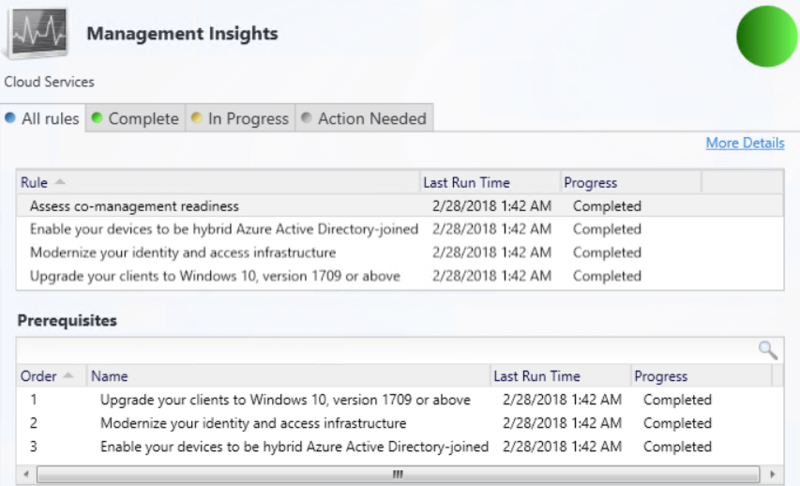 Enable devices to be hybrid Azure Active Directory joined: Azure AD-joined devices allow users to sign in with their domain credentials while ensuring devices meet the organization's security and compliance standards. For more information, see Azure AD hybrid identity design considerations. Update clients to the latest Windows 10 version: Windows 10, version 1709 or above improves and modernizes the computing experience of your users. For more information, see Key articles about adopting Windows as a service. Insights that help simplify management by cleaning up and reconfiguring collections. Empty Collections: Lists collections in your environment that have no members. For more information, see How to manage collections. Starting in version 1806, the rules in this group highlight potential configuration issues to avoid through upkeep of Configuration Manager objects. Boundary groups with no assigned site systems: Without assigned site systems, boundary groups can only be used for site assignment. For more information, see Configure boundary groups. Boundary groups with no members: Boundary groups aren’t applicable for site assignment or content lookup if they don’t have any members. For more information, see Configure boundary groups. Distribution points not serving content to clients: Distribution points that haven't served content to clients in the past 30 days. This data is based on reports from clients of their download history. For more information, see Install and configure distribution points. Enable WSUS Cleanup: Verifies that you've enabled the option to run WSUS cleanup on the properties of the software update point component. This option helps to improve WSUS performance. For more information, see Software update maintenance. Unused boot images: Boot images not referenced for PXE boot or task sequence use. For more information, see Manage boot images. Unused configuration items: Configuration items that aren't part of a configuration baseline and are older than 30 days. For more information, see Create configuration baselines. Upgrade peer cache sources to the latest version of the Configuration Manager client: Identify clients that serve as a peer cache source but haven't upgraded from a pre-1806 client version. Pre-1806 clients can't be used as a peer cache source for clients that run version 1806 or later. Select Take action to open a device view that displays the list of clients. Insights for improving the security of your infrastructure and devices. Unsupported antimalware client versions: More than 10% of clients are running versions of System Center Endpoint Protection that aren't supported. For more information, see Endpoint Protection. Insights that help you simplify the day-to-day management of your environment. Non-CB Client Versions: Lists all clients whose versions aren't a current branch (CB) build. For more information, see Upgrade clients. Insights for managing Software Center. Direct users to Software Center instead of Application Catalog: Check if users have installed or requested applications from the Application Catalog in the last 14 days. The primary functionality of Application Catalog is now included in Software Center. Support for the Application Catalog website ended in version 1806. For more information, see Deprecated features. Use the new version of Software Center: The previous version of Software Center is no longer supported. Set up clients to use the new Software Center by enabling the client setting Use new Software Center in the Computer Agent group. For more information, see About client settings. Insights related to the deployment and servicing of Windows 10. The Windows 10 management insight group is only available when more than half of clients are running Windows 7, Windows 8, or Windows 8.1. Configure Windows telemetry and commercial ID key: To use data from Upgrade Readiness, configure devices with a Commercial ID key and enable telemetry. Set Windows 10 devices to Enhanced (Limited) telemetry level or higher. For more information, see Configure Clients to report data to Windows Analytics. Connect Configuration Manager to Upgrade Readiness: Leverage Upgrade Readiness to expedite your Windows 10 deployments before Windows 7 goes out of support. For more information, see Integrate Upgrade Readiness.